Instead of continuing my Commodore story in the Vintage Computing series, I’m going to take a break this week between the holidays and write about some fantastic books and other material, both new and old about the computers of yesterday. 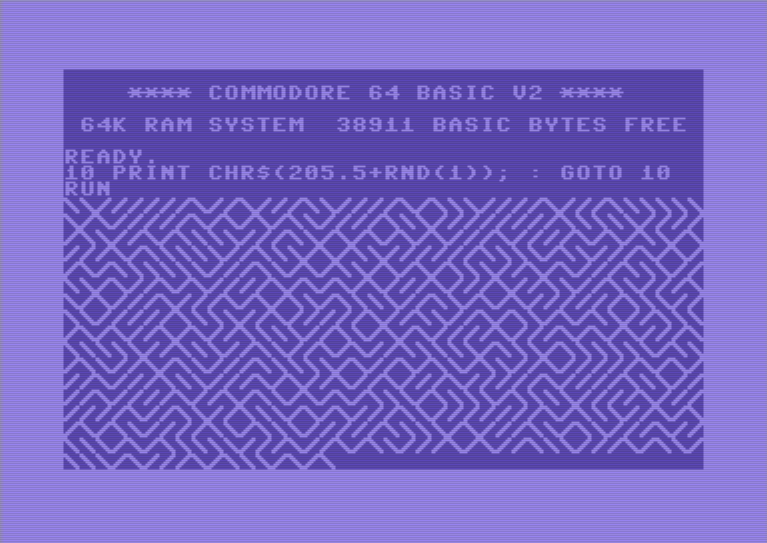 The first entry is a book I found about one year ago through a Slate article – the seemingly cryptic title 10 PRINT CHR$(205.5+RND(1)); : GOTO 10 refers to a tiny BASIC program running on the Commodore 64 that produces an instant maze line by line on the screen, like you can see it in the image on the right (click on it to enlarge). This program is why I love the simplicity of the old Commodore computers – you just can’t do something like this on a modern PC! The book is not strictly about programming, but about programming and computer culture – it takes the one-line program as a basis for a stroll through the computer history of the 1970s and 1980s. Sometimes things get a little too overanalyzed, but on the whole 10 Print… is very fascinating. The PDF is thankfully free to download on the website of the book, but a very pricey printed version is also available. Another interesting free book is again not solely about programming, but about the games industry of the 1980s is It’s Behind You: The Making Of A Computer Game from Bob Pape. It’s not even Commodore-related, because the author was responsible for the port of R-Type, a popular shoot’em’up console game, for the ZX Spectrum, but for his very interesting and fascinating tale I’ll gladly make an exception even if I know next to nothing about the innards about that other 8-bit machine. Those are the two newer free books, but if you are looking for more vintage computer books and magazines, I also found some great places on the web. Note that these digital republications are technically copyright violations, but considering their age the downloads at the following links can probably be seen as fair use nowadays. DLH’s Commodore Archive has literally thousands, maybe even tens of thousands of old books about just every Commodore computer ever built. The collection is awesomly extensive and even contains a vast archive of manuals for all sorts of software and hardware. There is also a fair amount of software in the form of diskimages including a collection of disk- and tape-magazines. The primary language is English, but there are also a few books available in other languages like German. 64’er Online provides a near-complete PDF archive of the German 64’er Magazin with the blessings of the publishers, or more exactly their successors. The original Markt & Technik has long ceased to exist and the name was even eradicated this year when the parent company chose to give up publishing. But this website has almost every issue of the 64’er Magazin from April 1984 to January 1999 – the only drawback is that for legal reasons all the wonderful vintage ads had to be blurred out. But the articles are all intact and are today of great historical value, providing an exciting chronicle of the Commodore 64 and 128 in the 1980s and 1990s. A similar archive can be found here, which also has the Sonderhefte, which are missing on the 64’er-Online website. The C64 Base is hosted by a pecuilar storage site, but I found the link while searching for old manuals – and this site has them aplenty. There are also tons of books, magazines and advertisements in many languages and even a huge software archive is somewhere inside the directory structure. I’m not entirely sure if this can still be described as completely legal or if it was even meant to be public, but I’m willing to take the risk of linking to it because there is so much amazing history in there. I can’t guarantee that there is not something dubious hidden somewhere in there, but to me it looks like a legitimate endeavour to save historical documents which otherwise would be lost forever.